Penllwyn Cottages01545 571677work Self-cateringPenllwyn Cottages are two beautiful cottages within walking distance of the Ceredigion Marine Heritage Coast - the first to be established in Britain and which recognises the unspoilt nature of the coastline and its wildlife. Cei Newydd cottage is a delightful holiday property which has been completely renovated from top to toe. The limewashed stone walls and pale blue touches of the cottage echo the nearby sea. The property has two ensuite bedrooms all on the ground floor and is wheelchair accessible. The bedrooms are one double and one twin (the twin can alternatively be made up as a super kingsize bed by means of the zip and link beds). The second bedroom has disabled facilities in its bathroom. A cot and highchair can be provided upon request. Facilities include underfloor heating, woodburning stove, dishwasher, washer/dryer, TV and DVD and a music centre with ipod docking station. Cei Newydd enjoys its own enclosed garden with decked, patio and lawned areas. Mwnt Cottage has a galleried kingsize bedroom (please note there is limited access to the bed from the sides). You can gaze at night through the skylights at the stars above. Mwnt benefits from oak and slate flooring throughout and its bathroom has a separate bath and shower. Mwnt cottage has its own enclosed garden with patio and lawned areas where you can relax and enjoy a barbecue in the long summer evenings. Penllwyn Cottages are two beautiful cottages within walking distance of the Ceredigion Marine Heritage Coast - the first to be established in Britain and which recognises the unspoilt nature of the coastline and its wildlife. The Ceredigion Coastal path is within a 1/2 mile walk. The nearby cove of Cwmtydu is renowned for smugglers and pirates, and seal pups can often be seen here in the autumn months. The coastal path affords excellent walking opportunities connecting all the local beaches and villages in the area. From the north follow the A487 through Aberystwyth, Aberaeron and Synod Inn. 0.9 miles after Synod Inn turn right at the church signposted Caerwedros and Cwmtydu. Drive through Caerwedros until you reach a crossroads with 'Peapod Junction' shop on your left. Go straight on at this crossroads and Penllwyn is a further 2/3 of a mile on your left. Please note if you are using SatNav you stop at Llainfran B&B - Penllwyn is a further 200 yards further on on your left. From the South take the A484 from Carmarthen. Follow the bypass around Llandysul towards New Quay. When you arrive at the crossroads at Synod Inn turn left. The following instructions are as from the north detailed above. 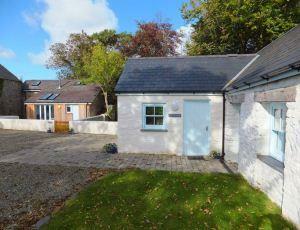 Cei Newydd Cottage for Wheelchair accessand has one en-suite bedroom suitably adapted. Mwnt Cottage would not be suitable for wheelchair access as it has an upstairs bedroom.